Something about this laid back entry that is speaking to me. It is saying, Fall is here. I love that fresh white and natural wood table. must be the table. neat! Gorgeous. And I kinda love that funky light fixture. I really love that console table! Oh I like. Rustic table + venetian mirror & natural light...la la love. Love the walls and ceiling! like. that little pendant is weird. what's new? miss you! That light, love it. Miss you my Boston friend! Its speaking to me too! It's wonderful. I really love that table! Loves it! Simple yet beautiful!! Beautiful! Wish I had the wall space in my entry hall for a table like this. 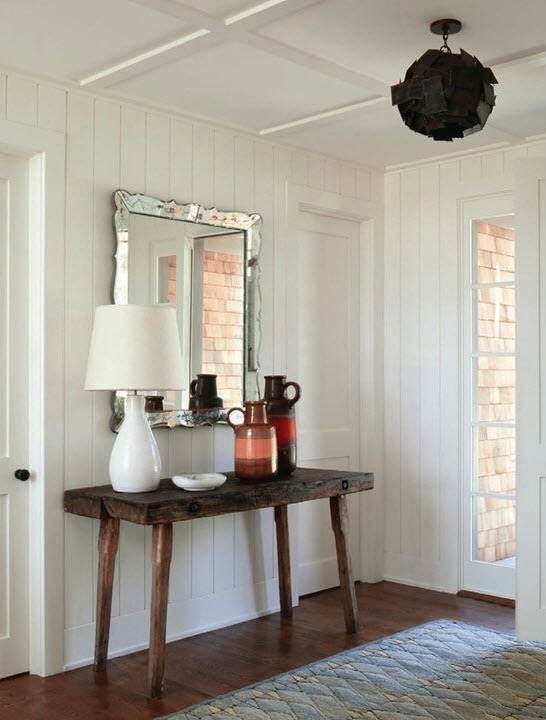 I love the simplicity of this entryway. It is inviting, yet not cluttered. I came across your post this afternoon while browsing interior design blogs and the topic of window treatment selection was very interesting to me. Can a window treatment be simple, yet beautiful? It is true that you must dress your windows appropriately to bring out their true beauty. Thank you for writing and as a special thanks to you and your readers, I would like to offer a 20% off coupon using this code upon checkout: BLG20. Does anyone know where the rug in this picture is from? I have been looking for it everywhere and haven't been able to find it anywhere! Melissa, I dont but I will keep an eye out to see if I find something similar.